These dyes are used to create photograms, continuous tone photographs, shadow prints and ombrès on fabric and paper. It is also great for painting, tie-dyeing, screen-printing, stamping, batik and more. Shake well before use. Apply to fabric or paper using a brush, sponge or brayer. While still damp, expose the design to sunlight and watch the color magically appear. The artist can place objects on a coated substrate to block development during exposure. Any object that casts a shadow will create a pattern. Use a film negative to create permanent photographs on paper or fabric. After image exposure, wash out the undeveloped dye with SolarFast Wash (JAJSD1902) and hot water, agitate vigorously. Machine washing is recommended for textiles. Color development is not fully complete until after washing. This dye thins and cleans up with water. The dyes can be blended together to generate personalized color themes. 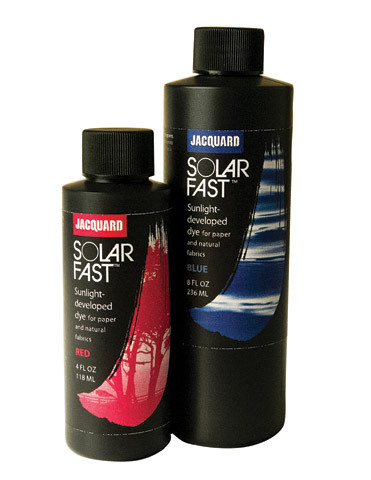 For screen-printing applications, use SolarFast Thickener (JAJSD1901).